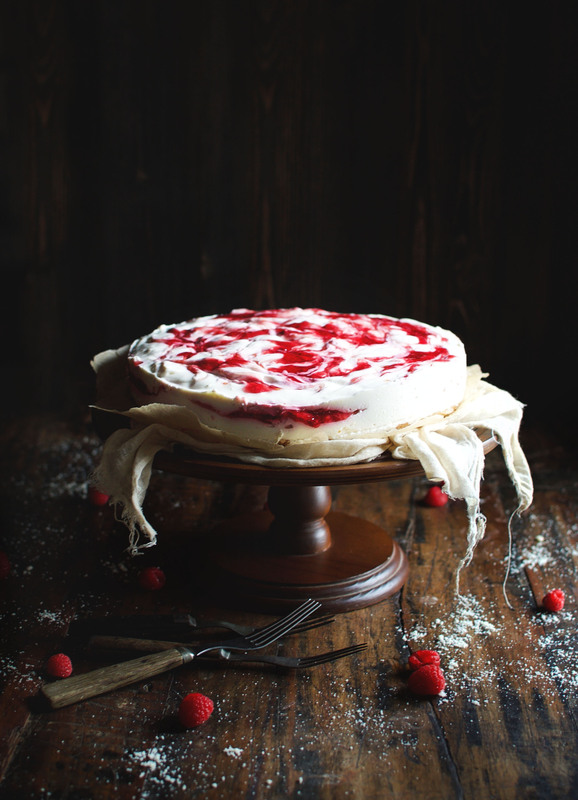 Celebrate Valentines day with our Low-Carb Raspberry Swirl Cheesecake. This cheesecake is a refrigerator cheesecake that is simple to whip up. It makes a perfect dessert for people on low-carb, gluten-free, grain-free, ketogenic, diabetic, LC/HF, and Banting diets. I love cheesecake! When I wasn’t eating low-carb, cheesecake was my go-to dessert at any restaurant. If it was on the menu and I was getting dessert, you bet I ordered cheesecake. Now that I eat low-carb, cheesecake is a dessert I have really missed. I decided to create a cheesecake recipe to satisfy the craving for one of my favorite desserts. This cheesecake’s extra-creamy filling combines raspberries with vanilla and lemon. This recipe is no-bake (except for the crust) and uses gelatin to transform the filling into a fluffy, raspberry lemon cloud. The texture is not as dense and heavy as New York style cheesecake, but is still a satisfying end to a meal. To provide more dimension to this decadent dessert we added a subtle lemon flavor–The faint tart flavor of the lemon perfectly compliments the sweet raspberry syrup. A gooey raspberry glaze swirled throughout provides a vibrant red color and lovely sheen. This Lemon Raspberry Cheesecake sits atop a delicate, flaky vanilla crust. Fruit is often avoided on a low carb diet because most fruits have a fairly high carb content. Raspberries have fewer carbs than most other fruits and contain loads of fiber. Even small quantities of can provide a huge pop of flavor without recking your carb intake. 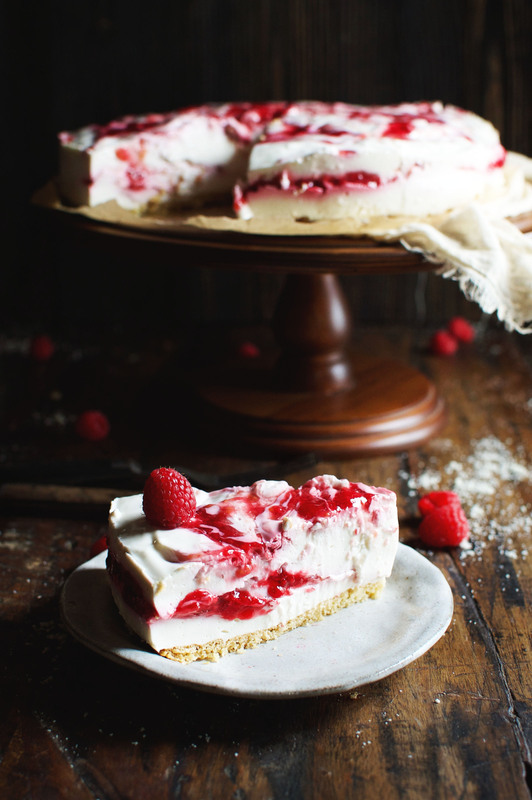 In this cheesecake the raspberries are the star of the show. The glossy raspberry syrup swirls peek through in every slice. Because this is a no-bake cheesecake, it needs time to set. To ensure this dessert is ready in time for serving, I recommend preparing it the night before. This allows the cheesecake plenty of time to set. If you can’t prepare it the night before, try to allow at least all 6-8 hours for it to set before serving. 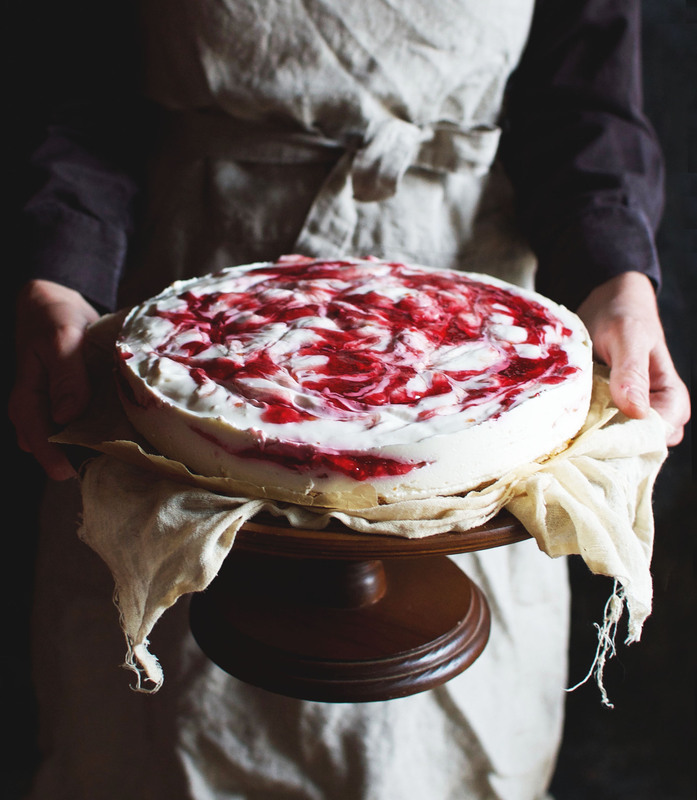 This Low-Carb Raspberry Swirl Cheesecake is a no-bake refrigerator cheesecake that is simple to whip up. 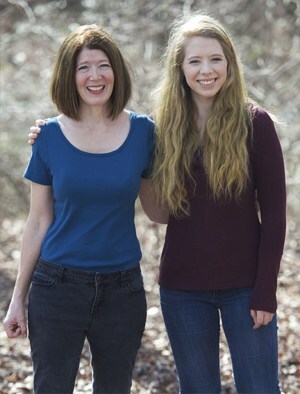 It makes a perfect for people on low-carb, gluten-free, grain-free, ketogenic, diabetic, LC/HF, and Banting diets. In a medium bowl, whisk together the almond flour, stevia/erythritol sweetener, baking powder and the pinch of salt. Stir in the vanilla extract. Cut in the butter using a pastry blender or a whisk. Transfer mixture into the prepared springform pan and press to form an even layer on the bottom of the pan. Do not cover the sides of the pan. Bake crust for 8-10 minutes or until beginning to brown. Remove from oven and allow to cool. In a small bowl, whisk together the stevia/erythritol blends and the unflavored gelatin. Whisk in 1 cup of boiling water and continue whisking until gelatin is completely dissolved. In a large bowl, beat cream cheese and sour cream until soft and fluffy. Beat in the lemon juice, vanilla extract, and lemon zest. Gradually beat in the gelatin mixture. Refrigerate about 45 minutes or until thickened, stirring 2 or three times during this time. In a small saucepan, whisk the stevia erythritol blend and the xanthan gum together. Gradually whisk in the water and the lemon juice. Stir in raspberries. Place mixture over medium-low heat, whisking frequently. When mixture just reaches a simmer, remove from heat and allow to cool before assembling the cake. Pour half of the cream cheese mixture over the crust in the springform pan. Spoon half of the raspberry mixture over it and swirl gently using a butter knife. Pour remaining cream cheese over the raspberry swirls. Spoon the rest of the raspberry mixture on top and swirl with a butter knife. Cover the springform pan and refrigerate overnight. The recipe states “1 envelope unflavored gelatin” – is this in reference to Knox gelatin? Thanks! An envelope of Knox gelatin will work perfectly. Other brands should work as well–just be sure the packet has 2 1/2 teaspoons of gelatin. I have a big bag of beef gelatin… Would 2 1/2 tsp of that work? Or is there a different ‘type’ of gelatin?? I used Knoxx in the recipe. I’m not sure how much of your gelatin would be equal. 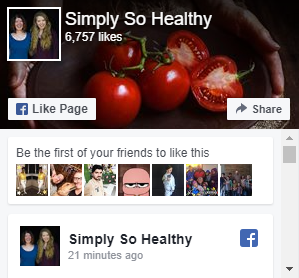 I see you use a blend of stevia/erythritol in your sweet baked goods. I don’t like stevia, so if I were to use only erythritol will the quantity differ? How do I adjust it? The blend that I use is twice as sweet as sugar. Erythritol is only about 80% (some say less) as sweet as sugar. To get the same sweetness, you would need to use about 2.5 times the amount of erythritol as the stevia/erythritol blend. My concern with the substitution is that erythritol has a strange cooling effect when used in large quantities.I like the combination of stevia and erythritol because the sweeteners tend to decrease the negatives of each other. I am hearing from other people that Sukrin + uses a very high quality stevia so it does not have a bitter aftertaste. I have not tried this product yet, but I plan to in the near future. Sukrin + measures the same as the sweetener I use in the recipe.Good luck! I find that I don’t like Stevia either..but when combined with Xylitol or Erythritol it is fine. Also adding salt helps decrease the bitterness of the Stevia. Hope that helps! Looking forward to trying this recipe too! Looks delicous! Can you use fresh raspberries? Sure! Be sure to cook them long enough to release their juices. I’ve used fresh raspberries before and it has worked fine. HI I’m vegatrian if I leave out the gelatin will that make a big difference? I’ve never made a cheese cake but would love to try your recipe. I think it will make a big difference if you leave it out, BUT I found an article on some substitutes that might let you make the cheesecake and eat it too! Check out the following link: Vegetarian and Vegan Gelatin Substitutes. Can I sub out the stevia blend for the Lakanto Monk Fruit/Erythritol blend at the same measurement? Thanks!! Making for my KETO Thanksgiving!! Vanessa, You will want to use more of the Lakanto because it is only about half as sweet as Pyure. Happy Keto Thanksgiving! This is perfect! I’m on a keto diet and have been looking for low carb foods to bake. This is it! I also love raspberries and cheesecakes so much! Thank you! Glad it hit the spot! I have been craving for cheesecakes lately. I will be making this raspberry swirl today! I love how it’s low-carb. It’s an absolute diet-friendly dessert for me. Thank you for this recipe, Annissa! Thanks so much. Sometimes we just need a little something sweet! Thank you for sharing this! Ive been eating low carb veggies and I will start planning for my low carb fruits and desserts so this is definitely in good timing!